I've been looking for the right mini tripod for years, but ... none that I tried were right for me and no other options looked tempting enough to try. 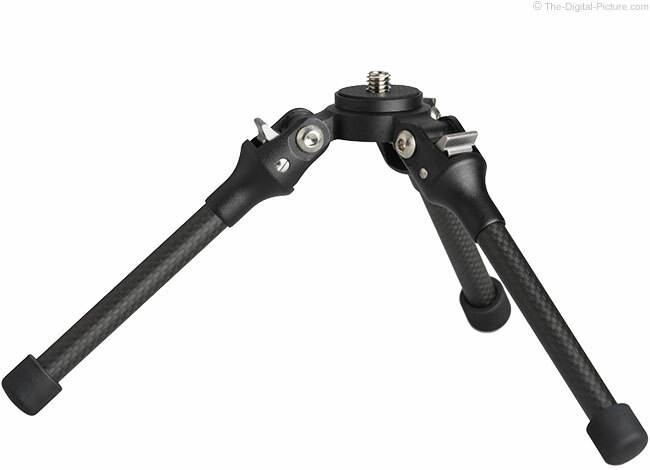 Then, just prior to a photo trip requiring a mini tripod or similar stabilization device, the Feisol TT-15 Mini Carbon Fiber Tabletop Tripod showed up on the market. Why did this mini tripod catch my attention? It is ultra-light at 6.7 oz (190 g). It is tiny, especially when folded to 3.1" (79mm) at the widest diameter at the spider (remember that the true dimensions are more triangular than circular) and 1.5" (39mm) at the rubber feet, fitting into less space in my pack than many lenses require. It has carbon fiber legs (low vibration, high strength and light weight). It has a big-for-its-size load capacity rating of 18 lbs (8kg). Topping off that feature set is a surprisingly low price. So, I bought one. And, that was a good move as this is great piece of kit. The Feisol TT-15's three fixed-length carbon fiber legs are capped with firm, non-slip rubber feet. The legs mount into an aluminum sleeve that hinges on the anodized spreader/top plate section that is CNC-milled from a solid block of aluminum. The thin rubber surface on the top plate measures 1.18" (30mm) in diameter and the metal plate below that measures 1.3" (33mm). Unless folding the legs in their reversed position (more later) interests you, your ball head can be wider than the top plate with no issues. I even had my full size Arca-Swiss Z1 ball head mounted on this tripod at one point, but a small or mid-sized head is more logical. The top plate has a 1/4" screw and a 3/8" adapter is provided (and commonly used for DSLR-sized tripod heads). 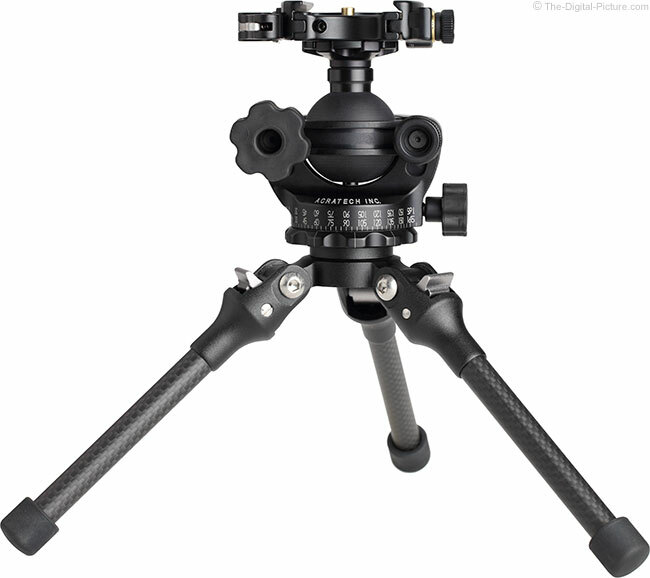 Mini tripods, especially those with fixed leg lengths, offer limited height adjustment capabilities. 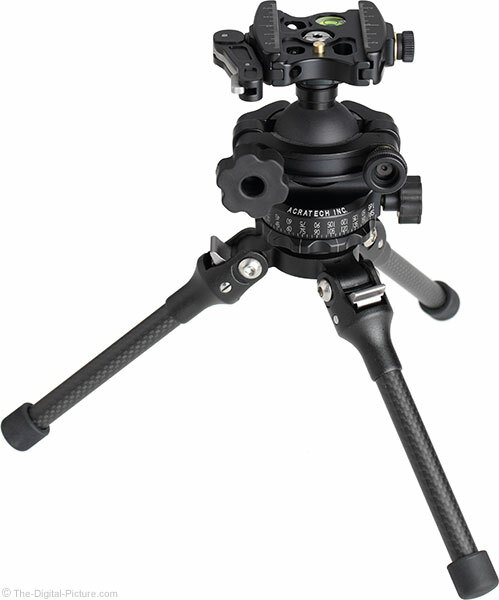 The Feisol TT-15 has two locked leg angles available with the 25° position providing 5.9" (150mm) of height and the 50° position yielding a 4.5" (114mm) height. Feisol suggests that the TT-15 can go flat on the ground and while they are right, there is no leg lock setting for that position which makes that use a bit awkward. With the legs able to move, a camera could tip over. I suggest using the wider 50° position for the most stability, but one or two legs can be placed into the 25° position if on an uneven surface. I mention stability primarily because of the risk of tipping over with the small footprint that this (and most/all other) mini tripods provide. For this same reason, I would like to see a third leg angle setting that takes the tripod height down even lower, offering an increased footprint. A downside to this feature would be some loss of strength due to lateral pressure being applied to the legs. The 50° angle locks work great for my use. As usual, this tripod's legs fold flat for transport and storage (a cinch-closed nylon bag adequately sized to hold the tripod and a small head is included). The Feisol TT-15 legs also fold mostly upward. As shown in the "Reversed" product image above, the legs will fold up over a small ball head, but they do not fold straight up. Reversed, the legs consume more volume than they do when folded in. It appears possible to mount a GoPro or similarly small camera on a small head upside down with the legs reversed for a very low perspective. I simply don't use the reversed leg capability. In the field, I've been using the Feisol TT-15 under an Acratech GP-s Ball Head (a very nice option) with full sized DSLRs and up to medium-sized pro-grade lenses. Smaller heads could be used, but the stability of this setup is quite impressive. Below is the TT-15 under a Canon EOS 5Ds R with a Zeiss Milvus 21mm f/2.8 Lens mounted. And, here is a front view of a Canon EOS-1D X with a Sigma 20mm f/1.4 DG HSM Art Lens mounted. 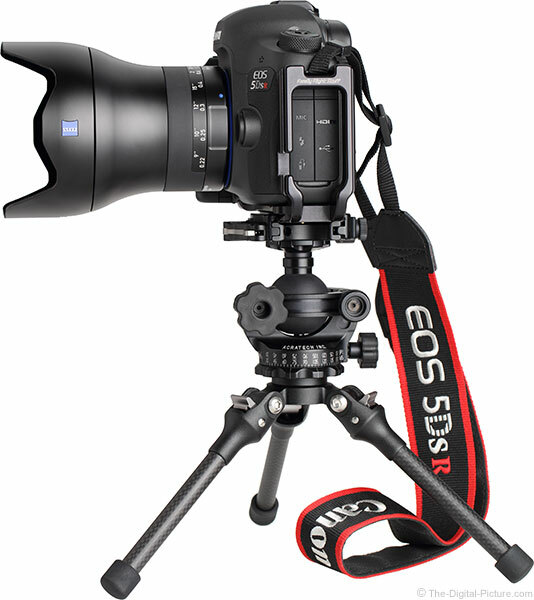 As I alluded to before, this tripod easily fits in most cases along with your other gear. 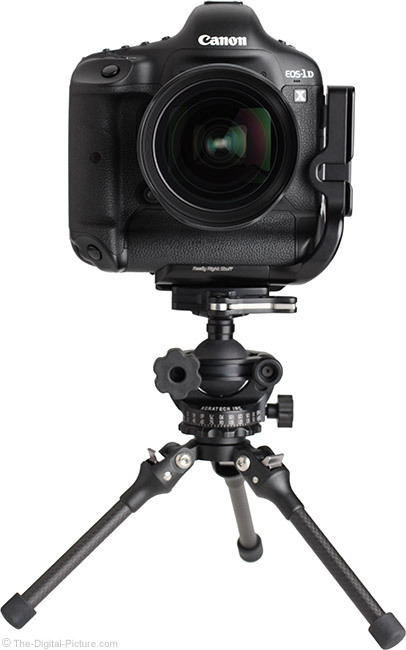 Sticking two of the feet into a small external pocket on a case also seems attractive, but note that, at this light weight, most ball heads are going to be heavier than the tripod and the head is going to pull down harder than the legs. In other words, it will be top heavy when carrying. Push the legs down into a pocket of your case and, unless the legs are cinched tightly, the head will try to twist it out. Another carry option is that, with the small ball head attached, simply let hang from the camera. The additional weight is not that significant. A couple of quick tips for using the TT-15: First, make sure that the head is very tightly attached. The top of the tripod has a rubber surface that I like to firmly compress under the ball head to eliminate a slight amount of flex it can allow. And second, as mentioned prior, I recommend using the wider leg spread setting with one of the legs oriented directly under the lens to minimize a tipping risk due to a lens hanging outward from the center point. Security personnel in the no-tripods-allowed location I photographed in had no problem with the Feisol TT-15 in use. This tripod gave me better results than any alternative support type I could have used, and the results were far better than what shooting handheld would have produced. 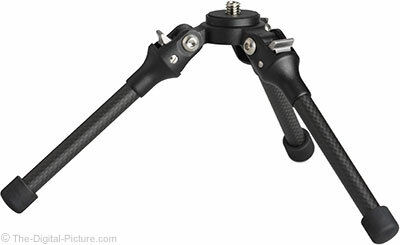 While a mini tripod's stationary camera support purpose is easy to discern, it also has use for camera-in-motion video. Press the mini tripod legs into your body/chest as you move about recording video. Your torso can better stabilize the camera than your handholding alone. I use a lot of gear that I never get the time to create reviews for, but this tripod is definitely worth telling you about. The Feisol TT-15 Mini Carbon Fiber Tabletop Tripod, with its light weight, small size, solid performance and small price, has earned itself a permanent role in my kit.